Yesterday my housemate (and best friend) Meghan and I decided to carve a few more Jack-o-lanterns for tomorrow’s festivities. The one we’d already done had been sitting on the front porch for a week, but even out of the elements it was looking a bit droopy and sad. The northwest damp isn’t kind to Jack-o-lanterns. Lucky for us the pantry held several extra pumpkins from Turner Farm where we have an organic produce share. We tend to get extras of everything ever since I investigated a mysterious death on the farm -- not that I’d solved that murder all by myself, mind you. I still shudder every time I walk by that darn compost pile, too. Meghan’s daughter, Erin, came in with two fresh eggs from the backyard chickens as we were scooping out pumpkin guts. Her cheeks were pink as she grinned an elfin grin. “I’ll separate the seeds to roast,” she piped, diving in to help. Brodie’s nails clicked on the hardwood as he waddled his ancient corgi self under the table in case some morsel of interesting food fell his way. Outside, the bright red leaves of the neighbor’s Japanese maple waved in the wind. We were scraping out the third and fourth pumpkins when we heard the front door open and close. Moments later, Barr and Kelly walked into the kitchen. Wiping her hands on a towel Meghan greeted Kelly with a kiss. Still elbow deep in pumpkin goo, I tilted my head as my dearly beloved approached and gave me a quick peck on the cheek. “Want to help?” I asked Barr. “Sure,” he said, heading for the tin that held his Earl Grey tea. Kelly grabbed a beer from the refrigerator and settled in at the big butcher block table to consult on carving designs. It took about thirty seconds before both men were thoroughly engrossed in the particulars of toothy grins and whether eyebrows would be more frightening or comical. There were four pumpkins and five of us, so I washed my hands and hung back while the others began to saw and cut at the orange flesh. “What’s your costume going to be this year?” Barr asked Erin. “Just because I did it before?” Erin asked. I put my hand on my husband’s shoulder. The Halloween night two years ago when Erin had dressed up as Ichiro Suzuki, then the right fielder for the Seattle Mariners, had been our first date. “He’s a Yankee now,” Barr insisted. “The way players move from team to team we just root for uniforms anymore,” he grumbled, bending back to the task at hand. I smiled and didn't point out how many years Ichiro had been with the Mariners. Looking around at my family – my made family – I was overcome with a deep sense of contentment. I loved these people, and I loved our home together. The door to the pantry hung partway open, and through it I could see the shelves packed with gleaming jars of home-canned tomatoes, pickled beets, asparagus, beans, and cucumbers, relishes and jellies and jams. Knobby braids of onions and garlic hung along the walls, and baskets of butternut, spaghetti, and acorn squash hunkered on the floor. In the crawlspace beneath the house, I knew bins of beets, carrots, parsnips, and turnips packed in sand would last most of the winter. The big freezer in the corner of the basement workroom where I ran Winding Road Bath Products was filled to groaning. And out by the chicken pen, under the cold frame that now covered one of the raised vegetable beds, greens and brassicas still flourished. Tonight we would gather in the living room after supper, light an apple wood fire and play Monopoly or watch a movie while munching on some of the popcorn from our farm share and sipping mulled apple cider. I felt like the luckiest woman in the world. A former resident of the Pacific Northwest where her Home Crafting Mysteries are set, Cricket McRae has always dabbled in traditional colonial skills. 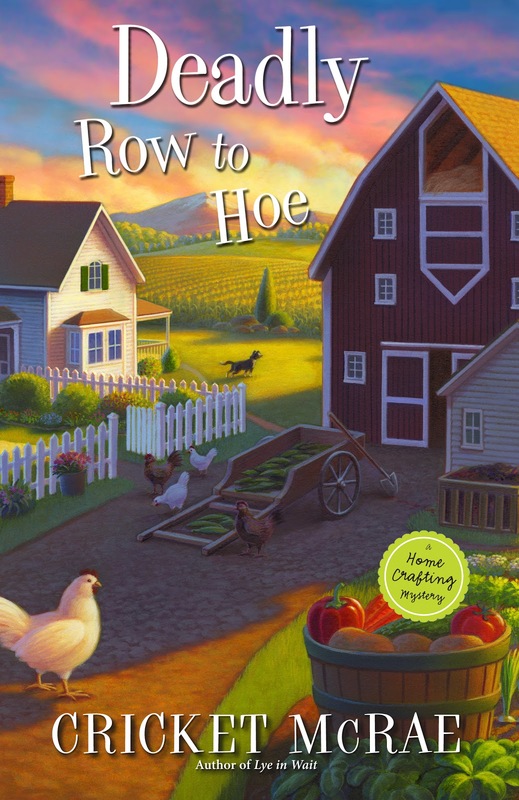 Deadly Row to Hoe is the sixth in her Home Crafting Mystery Series featuring soap maker Sophie Mae Ambrose. Cricket also writes the Magical Bakery Mysteries as Bailey Cates. For more information go to www.cricketmcrae.com or check out her blogs at www.hearthcricket.com or www.baileycates.com . The damp might be unkind to pumpkins in the Northwest, but the squirrels get them in the Midwest. Greedy, fat little things! Hi Willow -- come on over! Kath, I love/hate those little tree rats. Love to watch them scamper among the branches, hate losing most of my strawberry crop to them. I enjoy both of your series. 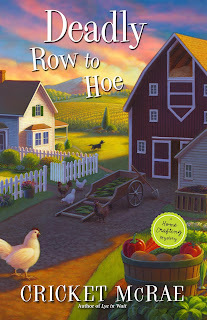 It's wonderful that there are new books coming out in both of them.